Gutter cleaning is laborious and gross, no homeowner enjoys this task. We offer gutter cleaning services so you don’t have to climb ladders and get your hands dirty. No more asking the neighbor boy or your husband to clean the gutters and no more fighting over whose turn it is. Call us and we’ll get it done quickly and efficiently. Homes and businesses alike can benefit from gutter cleaning. Keep the rain draining off your roof properly keeping gutters clean and have one less thing about home ownership to worry and stress about. Our professionals will do the job you dread with smiles on our faces because we love to make our customers happy. We clean gutters hand (ladders and all) to guarantee high quality results and a visually inspected clean. Gutters should be cleaned twice per year to provide preventative maintenance to prevent clogs, overflows, and damage. We’ll even get the grit and granules from roof shingles out of your gutters to prevent sludge build up. Any kind of clog or build up can cause costly damage to your home and gutters filled with leaves can become unsightly when it can be seen from the street. If your gutters are near tall trees or your roof shingles are getting old, more frequent gutter cleaning may be needed. Keeping trees properly trimmed and the roof in good repair may decrease the need (but twice per year is still recommended). When gutters get clogged, water will sit in muck which can cause wood or shingles around the gutters to rot and bacteria, mold, and mosquito breeding to begin the standing water. When the gutters get clogged and filled with water and debris they may begin to sag (especially if there are structural issues or the gutters are old). If the muck begins to dry during dry seasons, it can then cake onto the gutters, making cleaning much more difficult and allowing for more debris to pile up come the next big rain or storm. 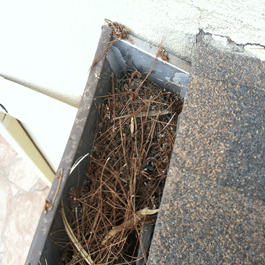 Get your gutters cleaned properly and regularly to prevent health concerns and costly home repairs. You’ll thank us later. Gutter guards and gutter screen systems can prevent some clogs and buildup, but the gutters and guards still need to be cleaned regularly. The extra guards and screens are great for areas of high rain or debris falling (plants, dirt, etc) but they can still get clogged and be rendered useless. Small debris like silt can slip through the screen causing a heavy sludge which can still easily clog gutters and downspouts. Act now and have your gutters cleaned and we can discuss what times of year are best for gutter cleaning in your area. Prevent costly damage caused clogs and standing water for a cleaner, safer, more beautiful home. You won’t regret it. 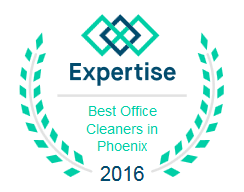 Arizona Window Washers for your window and gutter cleaning services need.